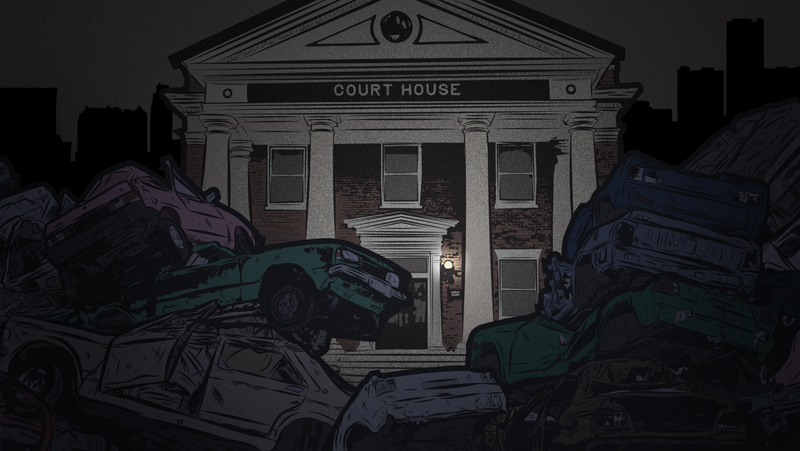 As Jalopnik and Gizmodo Media Group’s Special Projects Desk discovered in a months-long investigation last year, subprime auto lender Credit Acceptance Corporation has all but turned Detroit’s 36th District Court into a debt collections agency, with one in eight civil cases filed there being a Credit Acceptance collection lawsuit. Now we found the exact means we used to gather the data key to that story won’t be possible anymore due to a digital roadblock. What gives? In October, then-Jalopnik writer Ryan Felton and I published a story, building on legal think tank Plainsite’s findings, about how subprime auto lender Credit Acceptance Corporation has filed collection suits against at least 32,709 Detroit car buyers between 1995 and 2017 in Detroit’s 36th District Court. To arrive at this very specific number I had to scrape the text of a majority of the cases filed in the 36th District Court during this period from the court’s website. The case files were free and publicly accessible online. Over this period I collected the texts of 749,924 cases. I then programmatically analyzed the case texts to determine how many had been brought by Credit Acceptance Corporation, how much money Credit Acceptance Corporation garnished from each defendants’ wages, how many of these defendants filed for bankruptcy, etc. We figured these findings had immense public value, as it painted a damning portrait of the court’s role in the cycle of subprime auto debt that plagues many Detroit residents. It wouldn’t have been possibleto find any of this detailed information about Credit Acceptance Corporation’s loan collection cases without the easy availability of the case texts. In putting all these cases online, Detroit’s 36th District Court was providing transparency into legal matters of public importance, as is expected of them. Creating a helpful infrastructure to enable this transparency allows journalists like us to draw the public’s attention to matters of crucial relevance. In reporting our story we found that the court received at least 1,696 orders for bankruptcy stays from defendants in these cases. This finding alone is evidence enough that Credit Acceptance’s loan collection suits are a Detroit-wide concern—and, given the subprime loan crisis in general, a matter that affects the entire auto industry. It is confusing and infuriating, then, that the court has decided to severely limit access to these case texts. Last week Christine MacDonald, a reporter from The Detroit News, informed me over an email exchange about the above story that the court has added a CAPTCHA layer to the case search interface. CAPTCHA technology prevents any machine or program from accessing a part of a website; it only allows human visitors of the website through to the pages it guards. With the addition of this CAPTCHA layer, it is now impossible to programmatically scrape for a large volume of cases like I did while reporting on the Credit Acceptance Corporation story. We reached out to the court for a statement about why they had introduced this CAPTCHA layer, and whether the decision to do so had had anything to do with our story. The court administrator I spoke to had not read or heard of our Credit Acceptance Corporation story and told me that court’s IT department had added the CAPTCHA layer as one of a series of general security updates. I emailed the court’s IT department last Thursday for further information (I was unable to reach them by phone), but as of this writing I have yet to receive a reply. Whether in response to our story (the court might have been incensed by our story drawing attention to its near-insolvency five years ago and suggesting that the fees it collects in cases filed by Credit Acceptance’s debt collectors offer a steady source of income keeping it afloat) or otherwise, this is a severe limitation of the transparency the court provides to citizens. Adding this CAPTCHA layer provides precisely one type of security: The ability to only let humans and not machines through to access the case texts. It doesn’t “rate limit” requests to the website, so it wouldn’t provide any security against distributed Denial of Service attacks (dDoS) on the court’s website. Further, the CAPTCHA is triggered only after a user clicks on a case from the search results, so it is not limiting search queries to the case database either. So it is clearly not designed to protect against machines bombarding the database server with requests. Admittedly, there are other types of security websites need, but it seems that the only protection this particular CAPTCHA layer newly provides the website with is that it prevents the automatic collection of large amounts of case data from the website. One wonders why a court that offers case texts for free would want to prevent the collection of large amounts of case data. I spoke to Mike Lissner, executive director of the Free Law Project that runs the RECAP browser extension and archive—the browser extension allows users to archive a case text they bought from PACER, the federal court document access service, thereby providing it for free to anyone else looking for that particular case in the future. Putting up CAPTCHAs to prevent the public from accessing bulk legal data is a short-sighted and anti-democratic measure. Courthouses must start seeing themselves as publishers of the justice that they produce, and access to complete legal resources is table stakes for realizing that goal. Often courts will partner with outside vendors to provide legal data on their websites, and it appears to be pressure from those vendors that leads to measures like these captchas. When that is the case, courts must have the legal agreements, the will, and the guts to resist the restrictive urges of their vendors. Failure to do so leads to an absence of transparency, a curtailment of legal research and innovation, a poorly informed citizenry, and ultimately, unfair anti-democratic outcomes for the public. Detroit’s 36th Court and other courts all over the country should remove CAPTCHA layers such as this from their online case databases. Public records are public. The more easily accessed they are, the better.